One night last week, Ty was drying our oldest’s hair while I looked for a pre-bedtime snack for the toddler. One that wouldn’t be super messy and undo the bath she just had. I called out over the sound of the blow dryer, “You’re so careful and gentle. You should dry my hair next!” I laughed. He smiled but stayed focused on his task. A few minutes later, the blow dryer clicked off, and Abby came out of the bathroom beaming. Her hair dry and shiny. I walked into the bathroom to get everyone’s toothbrushes, and Ty was still holding the blow dryer. “C’mon.” He motioned me forward with his free hand. I laughed and stepped forward. Did we have time for this? Was he really going to dry my hair for me? He just smiled and put a hand on my shoulder to turn me around. Ty moved the brush through my hair slowly, methodically, intentionally. Why would he do this for me? How boring to dry someone else’s hair! What are the kids doing right now? They’re probably getting all messy again! Are we running late? We don’t have time for this! Is he really going to do this for me, dry it all the way? I shouldn’t have asked him! While my mind bounced around, Ty moved the brush through one section of hair at a time, the blow dryer along with it. Because I finally realized that this man will stop everything just to do me a simple favor. He hit the pause button on our hectic nightly routine and said yes to making me feel loved. And he didn’t see it since my back was to him, but my eyes spilled over onto my cheeks. You don’t want to let yourselves become the type of couple that just goes through the motions of your daily routine without stopping to enjoy or appreciate each other. But when your little ones need so much from you all the time, it’s easy to feel like you’re roommates instead of soulmates. Instead of trading playful banter while you make dinner together, you both reach the end of your patience trying to help your toddler recover from an epic meltdown. Instead of actively listening to what’s weighing on your partner’s mind, you multitask the listening and the laundry…because when else will the laundry get done? You start to feel disconnected, unheard, or under-appreciated. Maybe all of the above. And you know you want to fix it, but how? Because in the chaos of parenting life, you can’t always make time for fancy date nights or afford the grand gestures like a surprise weekend getaway. How are you supposed to reconnect as a couple when extra time and money are nowhere to be found? You don’t need grand gestures to reconnect with your partner. All you need to reconnect is something that’s so simple and quick even tired parents can make it happen. It starts with the Magic 5:1 Ratio. Here’s how it works: Research shows that in happy adult relationships, you need a ratio of five positive interactions to every one negative interaction. If you have too few positive interactions to balance out the negative ones, you’ll end up with an unhappy, unhealthy relationship. For example, feeling like your spouse didn’t hear something important you were trying to say? That’s a negative interaction. To close the distance in your relationship after something like that happens, make sure to get five positive interactions on the books as fast as possible. And this is particularly interesting to me as someone who’s been divorced and seen it play out firsthand: Science shows that couples who are unhappy with their relationship – the couples who tend to get divorced – have a positive to negative ratio of 0.8:1. In other words, for every one negative interaction, those couples don’t even have one full positive interaction to balance it out! Yikes. Thank goodness we now know about the Magic 5:1 Ratio so we can stop that from happening. For the next time you’re feeling disconnected from your partner, here’s a list of a few simple ideas to help you hit the Magic 5:1 Ratio. Below, you’ll find 20 ideas for how to reconnect with your spouse – even when you’re tired. Because reconnecting with your husband, wife, or partner doesn’t have to be a big ordeal. Most of these ideas you can do immediately in the spur of the moment with no preparation necessary. Plus, I made you a handy printable with 40 bonus ideas (including a handful of fresh ideas just for the bedroom). You can send the link to this post to your partner, or print out the post if he prefers to read on paper. Or if you think he may want something a little more “official,” try sharing this post from the research institute that uncovered all this awesomeness. 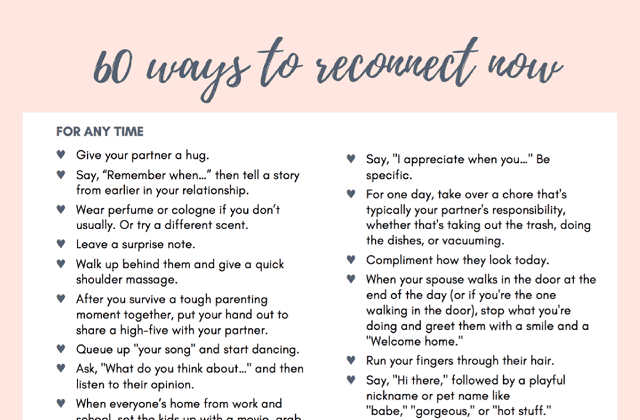 Before you leave this post, download the printable below so you can hang it on your fridge to help you remember how to reconnect with your spouse when the chaos of parenting life gets in the way of enjoying and appreciating each other. Or if you prefer to make this a private goal of making your spouse feel special, keep the cheat sheet in your purse or wallet as a reminder to yourself. For the best success, treat this as a shared journey with you and your partner to a healthier relationship. If it turns into a blame game of “you’re not following up negative interactions with enough positive interactions,” that will kind of defeat the purpose. This isn’t about keeping score. Aim for five of these positive experiences with your spouse after a tough moment, and you’ll be on the road to making your relationship stronger than ever. Fair warning: Every single idea on this list may not be a good fit for you and your partner, and that’s okay. But try to keep an open mind because you may find a new favorite thing to do together – and you might even get an open invitation to Dad’s Hair Salon. Give your partner a hug. Make sure it’s a good quality hug of six seconds or more. Here’s why. Say, “Remember when…” then tell a funny or emotional story from earlier in your relationship. Wear perfume or cologne if you don’t usually. If you do usually wear it, try a different scent. Walk up behind them and give them a quick shoulder massage. After you survive a tough parenting moment together, put your hand out to share a high-five with your partner. Queue up “your song” and start dancing. If you don’t have a song yet, try my epic list of the best ever love songs. Ask, “What do you think about…” and then listen to their opinion. When everyone’s home from work and school, set the kids up with a movie, grab your spouse by the hand, and go in the bedroom to lay down and just talk for a few minutes with no one interrupting. Send them a funny e-card. Text them the lyrics to a love song. Here’s a love songs playlist to get you started. If you can’t afford a date night, ask your spouse out on a lunch date. Actually, do this even if you can afford a regular date night. Take turns writing in a journal to each other. You write in the journal, then leave it on their pillow, then they write back and leave it on your pillow. You can use any journal or get one specifically designed for this purpose, like this journal just for couples. If you’re not sure what to write, start by writing what you admire about your partner. Get this set of fun (but powerful!) conversation starters for couples and ask each other one question every night before bed. Make cookies or brownies from scratch, just because, and keep them all to yourselves. Write down your bucket list of everything you want to do as a couple. Grab a picnic blanket and wine or hot tea, and head out to your front yard or backyard to stargaze and unwind from the day. After a negative interaction, you feel the distance between you and your spouse, but it’s not always easy to know how to close the gap so you both feel loved and connected. Use this cheat sheet to help you reconnect with your partner after those tough moments. You’ll find these 20 ideas plus 40 more simple ways to reconnect. Download the free cheat sheet. Join my weekly-ish newsletter and as a bonus, you’ll get the printable! Just click here to download and subscribe. Tuck your cheat sheet somewhere handy like your purse or wallet. Or if your spouse is in on it, hang it on your fridge. Then when you need an idea for reconnecting, pick a random idea and do it. What tried-and-true ideas do you have for how to reconnect with your spouse? Share in a comment below! Thank you so much for this article. The email came at a perfect time! Thank you as occasionally we do need to reconnect! I’ll try your suggestions though how to talk politics when on opposite side of the street? I have learned to say, “I respect that.” and I try to not make him feel foolish but…need to go beyond that. These tips are just on point. A must read for every couple. Wonderful article. Exactly what I needed! Thank you so much for this. It’s so easy to get caught up in the hustle and bustle and forget about our spouse. I’ll be implementing some of these things this week and I can’t wait to see the results!